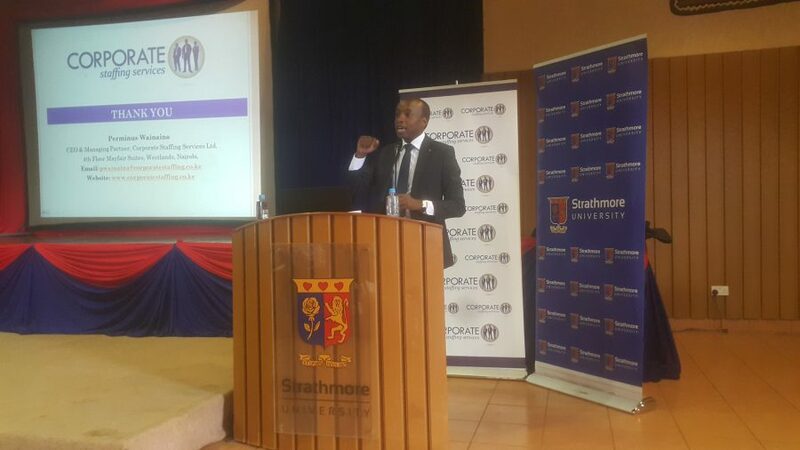 Last week, Strathmore University held a career talk in the main campus whereby Mr. Perminus Wainaina, the Managing Partner & Head Of Recruitment at Corporate Staffing Services was the keynote speaker. The free career talk was held on Friday 13th October 2017, at the Strathmore Business School and involved students from the university, most of whom were about to go for internships. Through his speech, Mr. Wainaina inspired the young people to make the most out of their internships. 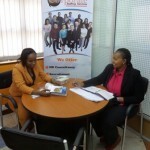 He pointed out that most young people are eager to land internships at some of the blue chip companies in Kenya, but according to him, the grass is never always greener on the other side. He urged them to take the internship opportunities that come their way as long as they get to learn something at the end of the day. An internship is supposed to give you an edge in the job market and make you employable. Before you apply for an internship, identify the companies that you would like to intern with. Learn as much as you can about them to determine if you would fit it. When applying for internships, customize your CV and cover letter to fit the organization you are applying to. Don’t send generic applications as it makes you seem like any other job seeker. Just like when you are applying for jobs, brush up your interview and presentation skills prior to the internship interview. The best way according to Mr. Wainaina of making the most out of an internship involves to a great extent understanding yourself. Don’t go to an internship without clear set goals. What are you looking to accomplish at the end of the three months? According to the career talk, you should be in a position to grow your experience in your field of study. An internship is an opportunity of utilizing what you have learnt in class in a more practical manner. The more you put into your internship, the greater the rewards. Go the extra mile and do more than what you are supposed to do. This will make you stand out during the internship. An employer is likely to hire you if you are the kind of intern who was proactive. Be that intern who can be relied on, as Mr. Wainaina said. Avoid being the intern who never gives in extra – the kind of intern who reports at 8 and leaves at exactly 4 because that is what is expected of them. He urged them to remember that the internship is a gateway to future employment. Therefore, find opportunities to learn rather than waiting to be spoon-fed everything. Volunteer and chip in on ideas. You need to have something to write on your achievements section at the end of the internship. During the career talk, Mr. Wainaina used the example of James Mworia the now CEO of Centum whose career journey started as an intern and urged them to emulate his example by treating their internships like learning opportunities. And after you are done with the internship, don’t just leave and never look back. He urged the young professionals to do what he called post internship marketing. Send a thank you letter; after the internship is done, showing your gratitude to the company for allowing you to intern with them. Tell them that you have learnt a great deal and won’t mind a permanent position when that time comes. The employer will likely remember such an intern than the one who just packs up and leaves. Finish your internship report and send it to your mentors and ensure you copy HR in the emails. Most HRs In Kenya nowadays rely on LinkedIn when recruiting, therefore it would work in your favour if you are to upload the internship report and recommendations on your LinkedIn page. Also, ask for feedback on your performance as well as recommendation on what you could have done better. And lastly, after you are done with your internship, update your CV by putting the internship before the education sector. Mr. Wainaina conclude the career talk by urging the young people to work on their soft skills as employers are interested in that rather than the education levels and to make every opportunity during their internship worth it.